Fred, Con, Lila and Max find themselves alone in the rainforest after their plane crashes. Facing incredible danger they gradually learn to trust each other and find ways to survive including eating grubs and even tarantulas. After finding a map they set off for the city of Manaus on a homemade raft and find a mysterious man living in a hidden city. Is this one of the lost explorers Fred is fascinated with? Will he help them find their way back to civilisation? In time the children discover a little about this enigmatic man, his sad past and the reason he wants to keep the hidden city secret. 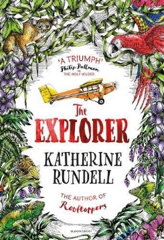 The Explorer is an exciting and beautifully written adventure story which describes the wonder, beauty and danger of the rainforest. This is a story about being brave despite your fears, paying attention to the world just as explorers do and why it might sometimes be ok to keep a secret. The book itself is really beautiful with many wonderful pen and ink line drawings of the setting and wild life framing the text. Which character do children find most interesting and why? Did the children do the right thing in keeping the explorer’s secret? Is it sometimes ok to keep secrets? Which is your favourite scene in the story? Could you survive in the rainforest – what would be the hardest part? Make a setting from the story in a shoe box opened down two sides using paint, collage twigs and foliage to decorate it. Using a scrap book make an information book about the Amazon. Research information using library books or the links below on the Amazon River, the rainforest, its wildlife, stories of lost cities or explorers who have disappeared. For another adventure story set in the Amazon see The Journey to the River Sea by Eva Ibbotson. Find out more about Percy Fawcett and other explorers who disappeared in the Amazonian rainforest.